China launched its secondsatellite in less than three days Friday when a Long March 3A rocketsuccessfully delivered a navigation craft into orbit. Liftoff of China's fifthnavigation satellite was at 2011GMT Friday (4:11 p.m. EDT) from the Xichang launch center in southwest China'sSichuan province, according to the official Xinhua news agency. The unannounced launch wasin the early morning hours of Saturday, local time. The three-stage Long March3A rocket left its payload in an egg-shaped transfer orbit with an inclinationof 55 degrees. The spacecraft will soon use its propulsion system tocircularize the orbit at an altitude of about 13,000 miles (20,921 kilometers). Chinese media reports saidthe satellite is part of the nation's Compass space-based navigation system,which aims to provide precise location, velocity and timing information tousers. State media did not namethe satellite launched Friday, but earlier members of the Compass constellationwere called Beidou, which means Big Dipper when translated in English. The system is similar tothe U.S. Global Positioning System and other navigation satellite fleets indevelopment by Russia and the European Union. 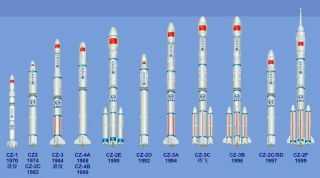 The Compass system willconsist of five satellites orbiting in the geostationary belt some 22,000 milesabove Earth, and 30 more craft circling the planet in a medium orbit, accordingto earlier Xinhua reports. Previous Beidou satelliteswere placed in geostationary orbit, but Friday's launch delivered the firstCompass satellite to medium Earth orbit. More satellites will jointhe Compass fleet in the next few years, and officials expect the system willprovide navigation data to China and neighboring countries by next year.Subsequent launches will then expand the system's coverage globally, Xinhuasaid. Friday's launch was thethird of the year for China. The newest Beidou satellite was put in space inFebruary, and a marinesurveying spacecraft was orbited Wednesday. Copyright 2007 SpaceflightNow.com, all rightsreserved.